The IAAS is delighted to announce that Dr Aoileann Ní Éigeartaigh will deliver this year’s W.A. Emmerson Lecture. 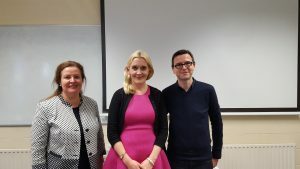 Dr Ní Éigeartaigh is a Lecturer in Literature and Cultural Studies in the School of Business and Humanities at Dundalk Institute of Technology. Her research interests include American Literature, Irish Literature, and Cultural Studies. Aoileann is also a former chair of the Irish Association for American Studies. Her lecture, “Liminal Spaces and Contested Histories in the novels of Juan Rulfo and George Saunders”, will take place at 4.30pm on Thursday, March 28th in room L4 in the Department of Business & Humanities, Dundalk Institute of Technology. Tea and coffee will be available from 4pm. The W.A. Emmerson Lecture is named in honour of, Tony Emmerson, one of the IAAS’s founding members and is a highlight of the association’s events. Information on previous lectures can be found here. The lecture is free and all are welcome to attend.